A professional wedding photographers, each year without fail, they receive a handful of inquiries asking if couples can have a discount on their services. Usually this request for a discount comes with a pitch "You won't have to edit the pictures; you can just give me all the RAW files." The short answer is always "No, you can't have unedited files". That said, a photographer wants potential clients to understand why. One of the most important things we can do as consumers is to be educated about what we're shopping for. Skipping the editing might seem like a fair trade from a distance. Editing takes up around 50-60% of photographer's work day, so having 60% of her/his time back to drink coffee and walk a dog, or dig in the garden is pretty much can be an dream. The truth is professional photographs don't come out of the camera ready to print. So what do they spend their editing time doing exactly? A typical wedding day takes a professional photographer through a variety of lighting scenarios. The day might begin in a kitchen with overhead fluorescent lights. Next we might move to a dark church, or into a lush green forest. The reception could take place in a hall under tungsten lights. Or a photographer's editing hell: with bright orange fairy lights under an open sky. The work a photographer delivers to her/his clients must be consistent from beginning to end. Colour correcting takes up around 40% of their editing time. A photographer brings her/his own lighting, and colour correct in camera where possible. Sometimes though, a photographer is not allowed, or it simply isn't practical. These places could include a church or religious site, a location that requires boating or hiking in with minimal gear, or places where lights will be a distraction. In these cases a photographer has no choice but to invest time in post-production colour correction. They may also make a creative decision to use a particular white balance setting to create a specific look in post-production. The camera is a tool that has limitations. Unlike our eyes, cameras only see and process a limited amount of light information. When we're talking about contrast in photography we're often referring to the luminance range of an image. This means the range of light between the darkest part of the image to the brightest part of the image. This range is measured in exposure stops. To give you an idea of this, our eyes see roughly 30 stops of light at any given time. A camera can only record somewhere between 8-12 stops in a single frame. No matter what settings a photographer has her/his camera set to, it will not record what a photographer sees with her/his eyes. Images must have the exposure, contrast and levels balanced if a photographer wishes for it to reflect what they see. Exposure and contrast affect the mood of an image. It is not uncommon for professional photographers to take creative liberties with this. A skilled editor will manipulate exposure, contrast and levels to enhance images. Deciding whether to convert an image to black and white is an important creative decision. Colourful festivities translate beautifully in full colour images. There are times, however where colour detracts from an image. When emotions are high and a photographer wants the viewer to focus on the emotion she/he often makes the creative choice of converting an image to black and white. Clicking the desaturation tool isn't enough though. Once converted to greyscale, reds and greens become just about the same tone, and details get lost. Skilled editors tone the luminance of individual colours separately, and yes, it's as time consuming as it sounds. There are many reasons why a professional photographer may crop an image. A photographer will crop images in order to improve the overall composition. A photographer uses the crop tool to minimize and eliminate distractions such as bright red exits signs, and people accidentally walking through frames. Another reason to crop is to create a stronger focal point for the image. Cropping is also necessary when changing the aspect ratio of an image you would like to print. If there is one thing a photographer should avoid like the plague, it's cloning and retouching. Retouching images is extremely time consuming. Retouching is monotonous, thankless work, so a photographer should try to do everything in her/his power to get the shot right in camera. Sign posts, garbage cans, graffiti, and people in the background can all detract from the overall composition of an image, but they cannot always be avoided in public spaces. A single image that requires heavy retouching can take hours to complete. 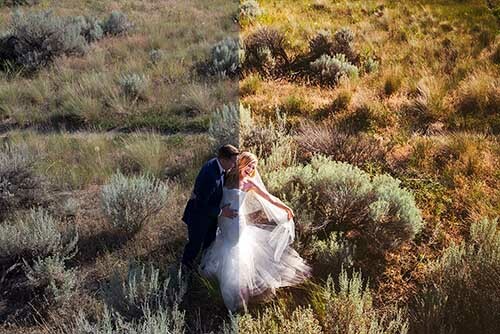 A photographer spends approximately 2-10 hours on each wedding she/he shoots retouching images. Professional photographers deliver 600+ images to the average wedding client. Ten minutes of post-work on each image easily adds up to one hundred hours of work. Sometimes photographer can edit an image in a minute or two, other times it take an hour or two. How a photographer interprets an image and edits it, is the very thing that sets them apart from other photographers. Asking a professional photographer to skip the editing is akin to hiring Gordon Ramsey to cook for you, and asking him for half-boiled, unseasoned chicken in exchange for a cut off the bill. Beautiful wedding photographs don't make themselves. Photographers put a lot of work in before she/he pushes the shutter, including collaborating on ideas, coaching couples through posing, location scouting, and other prep work. On the day of a wedding we work hard to tell compelling stories through meticulously chosen compositions. The camera however, is a tool with limitations, and it only gets us part way to our final vision. Professional photographers invest an equivalent amount of time into shooting as they do into completing their vision in post production. You receive the greatest return on your investment when you allow your photographer to complete her/his work.